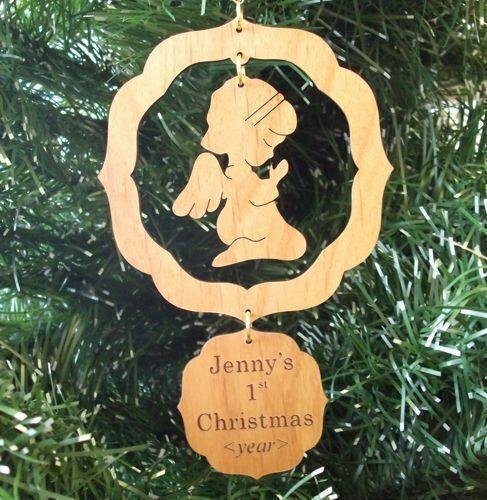 This wooden angel Christmas ornament makes a great Christmas gift. Consider personalizing the Christmas ornament with a person's name and the year. Also consider using a special Bible scripture reference or favorite saying. Normally up to 4 lines of 10 character per line will fit on the personalization medallion. A block font is normally used since it can be easily read. These Christmas ornaments are laser cut and engraved. The wood ornaments come in a white gift box with a clear front. 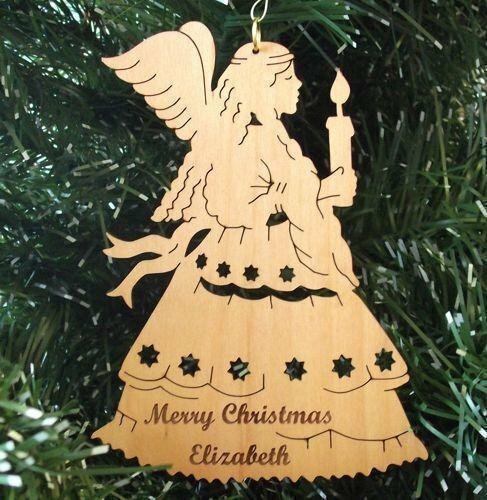 This wooden angel Christmas ornament makes a great Christmas gift. Consider personalizing the Christmas ornament with a person's name and the year. Also consider using a special Bible scripture reference or favorite saying. Normally up to 4 lines of 10 character per line will fit on the personalization medallion. A block font is normally used since it can be easily read. 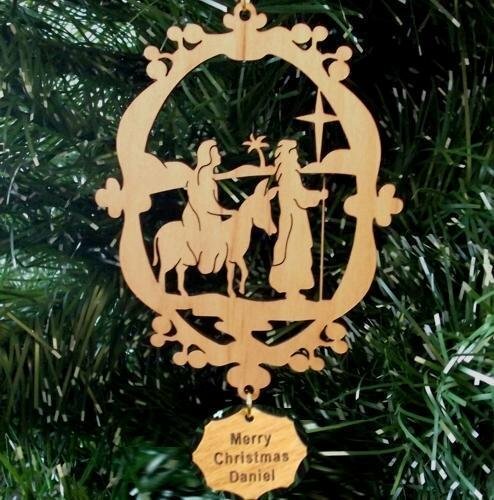 These Christmas ornaments are laser cut and engraved. The wood ornaments come in a white gift box. This wooden bear Christmas ornament makes a great Christmas gift. Consider personalizing the Christmas ornament with a person's name and the year. Also consider using a special Bible scripture reference or favorite saying. Normally up to 4 lines of 10 character per line will fit on the personalization medallion. A block font is normally used since it can be easily read. These Christmas ornaments are laser cut and engraved. The wood ornaments come in a white gift box with a clear front. 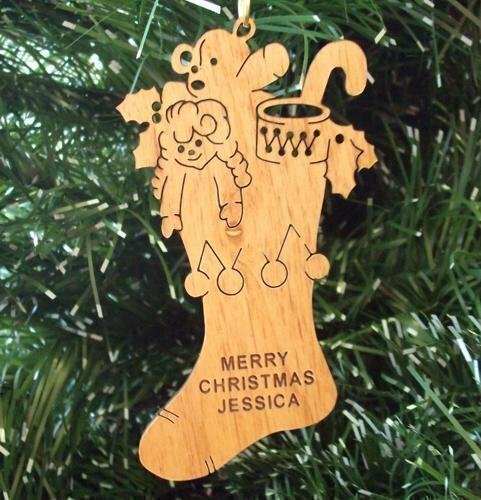 This wooden Christmas stocking ornament makes a great Christmas gift. 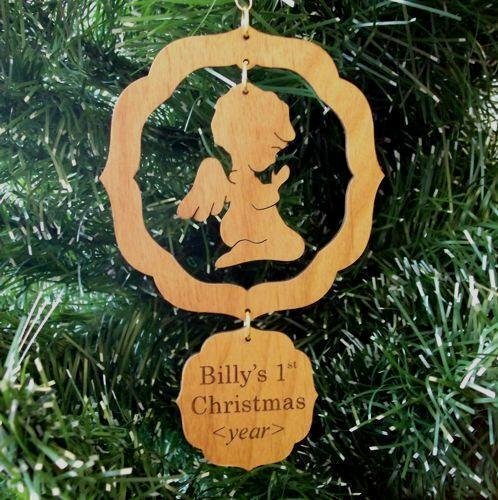 Consider personalizing the Christmas ornament with a person's name and the year. Also consider using a special Bible scripture reference or favorite saying. Normally up to 4 lines of 10 character per line will fit on the personalization medallion. A block font is normally used since it can be easily read. These Christmas ornaments are laser cut and engraved. The wood ornaments come in a white gift box with a clear front. 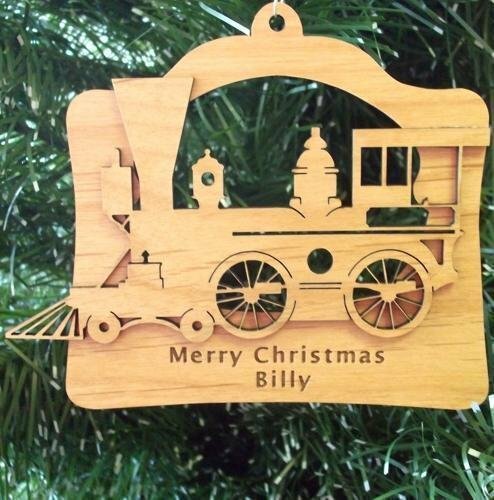 This wooden train Christmas ornament makes a great Christmas gift. Consider personalizing the Christmas ornament with a person's name and the year. Also consider using a special Bible scripture reference or favorite saying. Normally up to 4 lines of 10 character per line will fit on the personalization medallion. A block font is normally used since it can be easily read. These Christmas ornaments are laser cut and engraved. The wood ornaments come in a white gift box with a clear front. 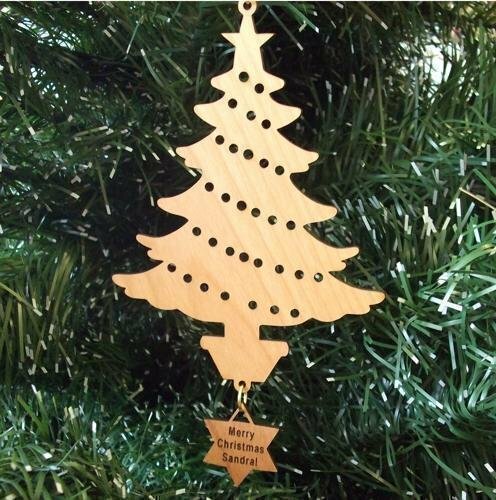 This wooden Christmas tree ornament makes a great Christmas gift. Consider personalizing the Christmas ornament with a person's name and the year. Also consider using a special Bible scripture reference or favorite saying. Normally up to 4 lines of 10 character per line will fit on the personalization medallion. A block font is normally used since it can be easily read. These Christmas ornaments are laser cut and engraved. The wood ornaments come in a white gift box with a clear front. 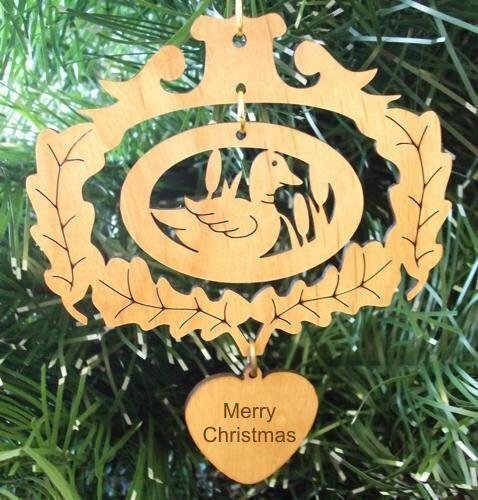 This wooden duck Christmas ornament makes a great Christmas gift. Consider personalizing the Christmas ornament with a person's name and the year. Also consider using a special Bible scripture reference or favorite saying. Normally up to 4 lines of 10 character per line will fit on the personalization medallion. A block font is normally used since it can be easily read. These Christmas ornaments are laser cut and engraved. The wood ornaments come in a white gift box with a clear front. 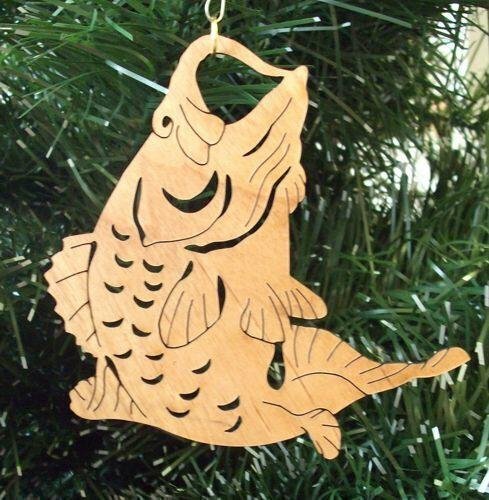 This wooden fish Christmas ornament makes a great Christmas gift. Consider personalizing the Christmas ornament with a person's name and the year. Also consider using a special Bible scripture reference or favorite saying. Normally up to 4 lines of 10 character per line will fit on the personalization medallion. A block font is normally used since it can be easily read. These Christmas ornaments are laser cut and engraved. The wood ornaments come in a white gift box with a clear front. This wooden Mary and Joseph Christmas ornament makes a great Christmas gift. Consider personalizing the Christmas ornament with a person's name and the year. Also consider using a special Bible scripture reference or favorite saying. Normally up to 4 lines of 10 character per line will fit on the personalization medallion. A block font is normally used since it can be easily read. 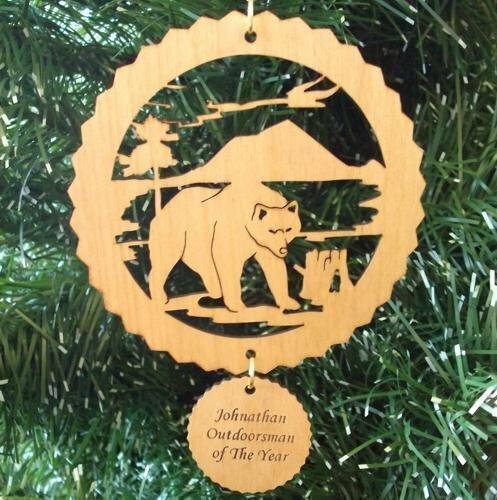 These Christmas ornaments are laser cut and engraved. The wood ornaments come in a white gift box with a clear front.